Congratulations to pupils Gemma McDowell and James Kennedy following their participation in the Sacramento Valley Scottish Highland Games in Woodland, California at the end of April. The long trip proved to be worthwhile for both Gemma and James as they achieved great success over the 2 day event. On Day 1, Gemma was awarded 1st Prize while James came 2nd. The following day saw Gemma lift 2nd prize and James achieved 3rd place with Gemma being voted Champion of Champion over the 2 days. 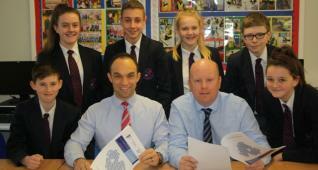 Well done to both Gemma and James on their success. 25/06/15 - DofE Expeditions End Successfully! 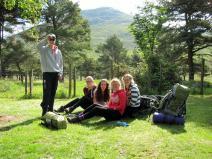 All has been safely gathered in for the Duke of Edinburgh’s Award – both pupils and equipment! 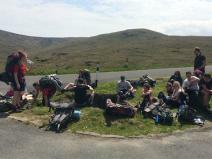 All four groups (28 pupils in total) have successfully completed their Bronze and Silver Expeditions in The Mourne Mountains, and what fantastic weather! 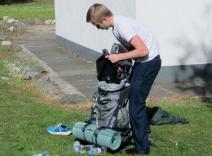 Beginning in Rostrevor, the Silver groups set out first. Special mention must be given to the boys who became the first group to successfully navigate themselves around a very tricky route above Kilbroney Forest. Mrs Graham set the challenge, and the boys didn’t disappoint. Well done! Meanwhile, the Bronze groups began their journeys from Meelmore Lodge, and managed to arrive in good time to Leitrim Lodge to their campsite. 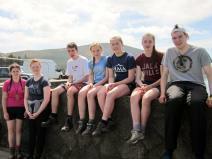 Day 2 would see the Bronze groups complete their expedition in Rostrevor. 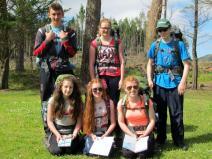 Mrs Nelson (Newry High School) commended the groups on their positive attitudes, their skills in navigation and stamina in completing the challenging route. 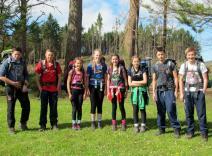 The Silver groups continued on Day 2, along Spelga Pass and onto their camp at Happy Valley. 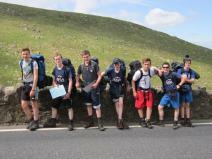 Never before had traffic along the Spelga Pass witness such knobbly knees, with the boys in their make-shift shorts. Luckily, there were no cars over the hedges! 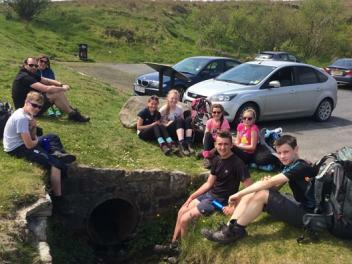 Day 3 then saw the groups trek up the Hare’s Gap and down by the Ben Crom and Silent Valley Reservoirs. Both groups are to be congratulated, having been the only groups that made it on time to their pick up point – maybe it was the thought of getting chips on the way home that kept everyone going! 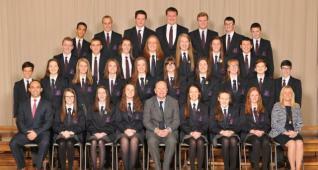 Well done to all pupils involved, in both Bronze and Silver! Your assessors very much look forward to reading your reports. To celebrate the end of another good year at Scripture Uunion, pupils had the opportunity of an outing to ‘The Rink’ just outside Portadown. The morning was spent skating until their hearts were content or blisters could take no more! Some pupils spent a fair bit of time on the floor but many became speedy, professional skaters. After this entertainment, the group went to Rushmere for lunch and some shopping. The outing was a great success and Miss Johnston would like to thank all those pupils who attended, and for their support at SU over the past few months. Year 8 pupils enjoyed a visit to Carrickfergus Castle on Friday 19 June where they were able to take a step back in time and explore one of Northern Ireland’s most striking historical monuments. This experience of living history enriched and consolidated the Year 8 pupils' understanding of the Norman conquest as they were able to explore this magnificent Norman castle. Pupils had recently studied castles in class and had developed cross-curricular links in ICT by completing an enquiry and PowerPoint presentation in class. They all had a fun time and thoroughly enjoyed their day out. 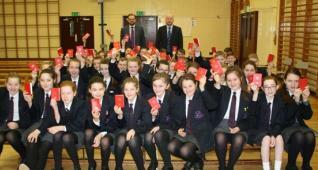 Our thanks go to Mrs Reid (Head of History) and Mrs Laverty for accompanying our Year 8 pupils. The main car parks at both Newtownhamilton High and Newtownhamilton Primary have experienced some changes over recent days. Freshly painted lines have resulted in additional parking while 2 new zebra crossings have been included for safety. The Primary School playground also has new permanent lines added in order to support the delivery of the Primary 7 Cycling Proficiency Programme and the teaching of GCSE Motor Vehicle & Road User Studies. Parents and visitors to both Newtownhamilton High and Newtownhamilton Primary are advised to drive slowly and carefully and should only park in clearly marked parking spaces. The 2015/16 School Calendar can be found by clicking here. 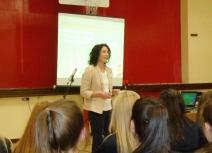 We were delighted to have a visit from Dr Claire McEvoy today. 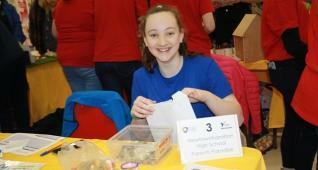 She is a Research Fellow at the ‘Centre for Public Health’ at QUB. Claire came into school as a STEM Ambassador to tell pupils about her career as a dietitian; the qualifications required to become a dietitian; and to talk about ‘Healthy Eating’. 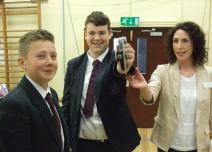 After her very engaging talk, Dr McEvoy gave pupils an opportunity to test their grip strength using a dynamometer. 19/06/15 - Joel and Aaron Hit the Right Notes! Joel Ewart and Aaron Mitchell, the 10X duo who are no strangers to the stage in Newtownhamilton High, are celebrating their recent success in passing Grade 2 Classical Guitar. Yes – classical guitar! This style demands a high level of skill, particularly in terms of plucking and intricate rhythm work. Being tested in their performance, as well as their technical scales and musical knowledge, the boys certainly excelled, and are demonstrating again that all the hard work and focussed practice pays off! Both boys attend weekly lessons in school, through the Education Authority (Southern Region) Music Service. Special thanks to their tutor, Mr Mervyn Braden, who remains a dedicated and most enthusiastic mentor for the boys. The boys now look forward to beginning GCSE Music in Year 11 with Mrs Graham, and during their music lessons with Mr Braden will spend time focussing on performance and composition. 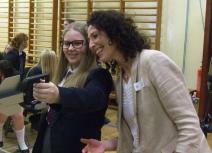 Again, it emphasises the fantastic benefits of pupils receiving ‘in-house’ lessons. We are very fortunate in Newtownhamilton High to receive guitar and woodwind tuition, and would hope that this could develop further. Well done again to Joel and Aaron – we will look forward to future performances! The recent pleasant weather conditions ensured record numbers attended our annual Sports Day (Tuesday16th June) and House Matches (Wednesday 17th June). Our pupils really got into the spirit of things by participating in a wide variety of track and field events on Sports Day before returning on Wednesday morning for the highly competitive house matches (hockey and football) on our impressive new 2G pitch. With everyone burning off the calories over the 2 days, some nourishment was required and therefore pupils, staff and the parents in attendance were grateful to the School Association Members that provided a barbeque on the Wednesday afternooon. The ice cream and cool drinks also proved popular with our athletes. A big thank you goes to our committed School Association Members and also to our PE Staff Mr J Black and Miss L Anderson. 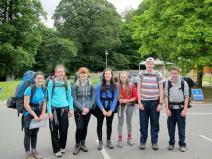 15/06/05 – DofE Practices a Great Success! 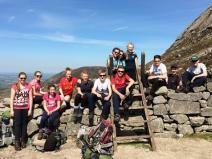 As the heat wave hit the Mountains of Mourne from Thursday, so did our Duke of Edinburgh Bronze and Silver groups. 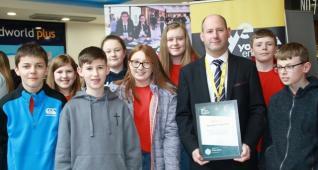 28 pupils in total are involved in the award this year, and under the watchful eyes of Mr Chambers, Mrs Graham and Mr Sloan, all 4 groups successfully completed their practice journeys. 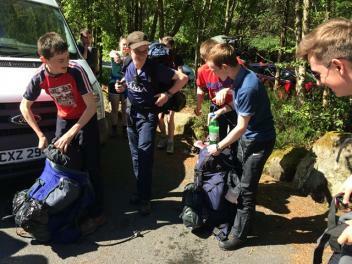 The Silver Groups were first to begin, along the Silent Valley and Ben Crom Reservoirs, down Trassey Track and into Tollymore Forest Park, whilst the Bronze Group set off in the glorious sunshine along the Ott and Trassey Tracks. We have heard of hills being alive with the sound of music, but on Thursday it was more resounding hollers of Sam Murray, who certainly made every attempt to keep spirits lifted along the route, as well as the speed, much to the amusement and delight of 10A girls, especially Ashley! 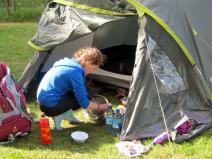 There were a few very relieved faces at camp in Tollymore Forest Park, not to mention the farmer’s tans – and we’re talking about the teachers too, not just pupils! 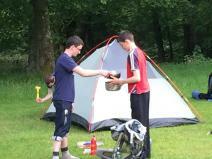 Tollymore Youth Campsite had never looked so appealing, especially getting the feet cooled off in the showers! Everyone demonstrated their culinary skills, including the Year 11 boys, with pots of pasta being most popular. I think everyone would agree, however that it was Kyle Bradshaw’s skill at frying an egg which was the highlight! The Silver groups progressed onto Day 2; 11X boys braved Happy Valley and the dreaded Pigeon Rock, and Group 2 navigated around Fofanny and Spelga. 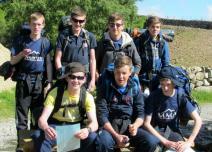 The Bronze groups completed their journeys, with the sunshine beating down on their brows as they made their final climb up to Ott Carpark. Never let it be said that walking the road is the easy option! Everyone, however demonstrated tremendous stamina and fitness, and teachers have every confidence that the assessed expeditions will be a breeze for the pupils. The Silver groups all made it safely into camp, at Hen Track, and after shifting a few sheep, comfortable spots were found for everyone. As is customary, chips were on the menu, much to the delight of all pupils, and after two long, hard days on the trot, there wasn’t much chat. 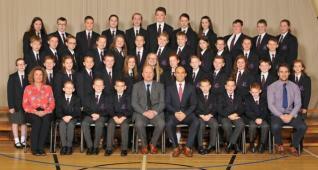 Well done to all pupils involved, and we hope you’re looking forward to getting back up and at it! Everyone is reminded that their pre-assessment check by Mrs Nelson from Newry High School will take place on Thursday 15 June. 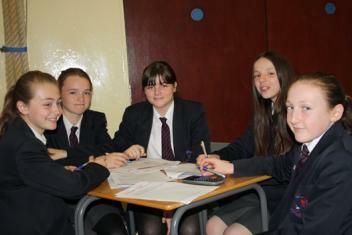 Year 8 and 9 students were working hard today developing their entrepreneurial and finance skills, with the team from Ulster Bank ‘Money Sense’ Programme. Five representatives from Ulster Bank came to advise the students on how to begin their own business, assigning different roles within their groups and helping to promote decision making and problem solving skills, as part of their LLW course. 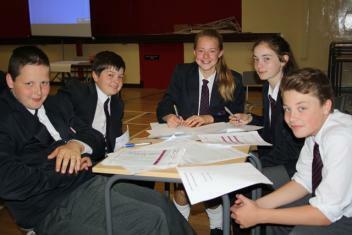 All pupils thoroughly enjoyed the experience and the opportunity to further enhance their knowledge on ‘Employability’. A massive thank you to Nuala Hayden, Leona Solan, Fiona Solomon, Adam Boyd and Clíodhna NicBhranair from Ulster Bank for delivering such an interactive course. The annual House Match Competition for hockey (girls) and football (boys) will take place on our impressive new 2G pitch on Wednesday 17th June. 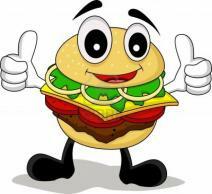 The event will run from early morning so our hungry pupils will be ready for a burger or hot dog (or indeed both!) from the barbeque which will be run by our committed School Association Members. 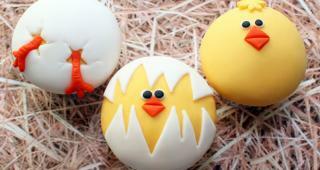 Burgers are priced at £2 and hot dogs £1.50, while drinks and ice cream will also be on sale. Parents are also invited to attend the barbeque from 1.00pm and are welcome to stay and watch the afternoon matches. Everyone Welcome. 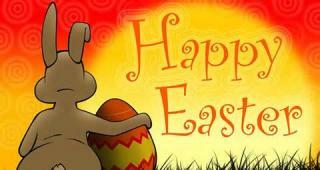 Pupils should note that the school canteen will only be open at break time on this date. 2014 Prize Winners are asked to return all cups and shields to the school as soon as possible so that they can be engraved and cleaned for Prize Night in November. Pictured is Caroline McBride with trophies that she was awarded during the 2014 Prize Night celebrations. The staff of both Newtownhamilton High and Newtownhamilton Primary Schools recently joined together to participate in Defibrillator and Cardiopulmonary Resuscitation (CPR) training with local nurses Mrs Helena McLean and Mrs Edith Henry. The new defibrillator was recently gifted to Newtownhamilton High School by their School Association Members and will be located on the site which is shared with Newtownhamilton Primary. A big thank you goes to Newtownhamilton High School Association for the defibrillator and also to Helena and Edith for sharing their expertise on how to use this very important piece of life saving equipment.